A municipal holiday is celebrated in Lisbon on the 13th of June, Saint Anthony's Day (Saint Anthony - Lisbon, 1195? – Padua, 1231). Although the main festive events are held on that day and on the preceding evening, the celebrations continue throughout the month of June in commemoration of two other saints (Saint John and Saint Peter), together constituting the so-called "Festival of Popular Saints". During this period, the houses and narrow winding medieval streets of the old quarters, in particular those situated around the castle (Alfama, Mouraria and Castelo) are decorated with arches, flowers and colorful balloons, and anyone wanting to dance, drink and eat the traditional grilled sardines, “chouriço assado” (flamed pork sausages) and “caldo verde” (kale soup) is made welcome. It is also a tradition for men to buy and present their girlfriends vases of sweet basil, decorated with paper flowers and love poems, since the festivities are associated with the summer solstice and ancient fertility rites. The religious events held during this period include, notably, the St. Anthony's Day Weddings, an initiative whose purpose is to encourage the mass wedding of financially disadvantaged couples and, on the 13th, a procession starting near the Lisbon Cathedral, in the church of St Anthony, built on the site where it is said the Saint was born. 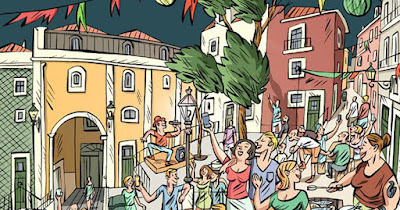 However, one of the highlights of the festivities take place on the evening of 12 June and consists of the "Popular Marches", a tradition that dates back to the 18th century and which has been celebrated in its current form since 1932. 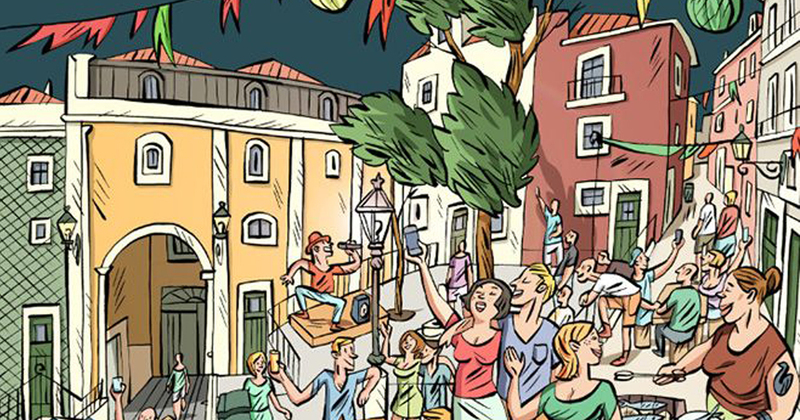 Residents of the districts of Lisbon descend to Avenida da Liberdade (Liberty Avenue) to compete with each other; marching, dancing and singing songs composed for the occasion, on a Lisbon-related theme announced in advance by the organizers. The varied costumes and choreography imbue the parade with the rare sense of color and exhilaration which make it a unique spectacle.